As I've told a couple of times before, I like to test knitting needles new on the market and I already showed you my Addi CraSyTrio the other day. 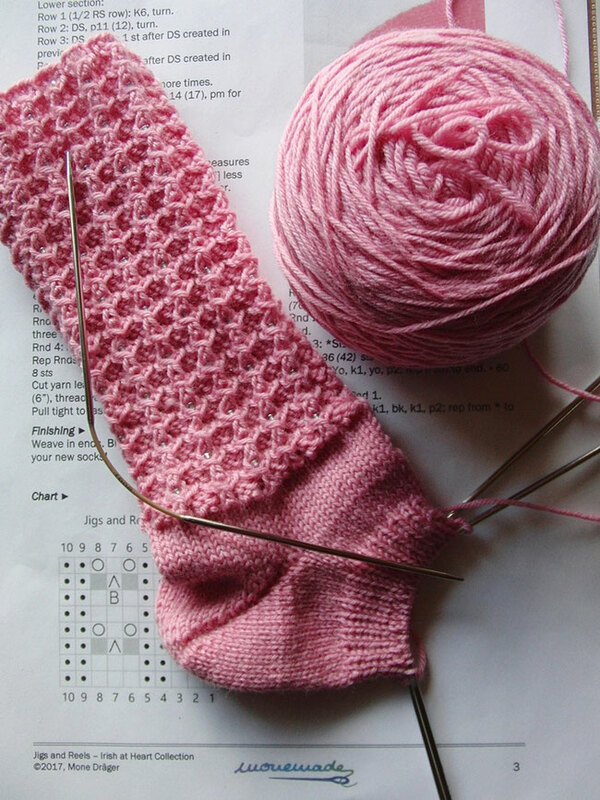 I started a pair of socks with them a while ago, but then switched to my 'go to' DPNs, because I was in a bit of a hurry and felt a bit clumsy with the new needles. So it was time for a second test and since I had planned to reknit my Jigs&Reels pattern, I went to work right away. 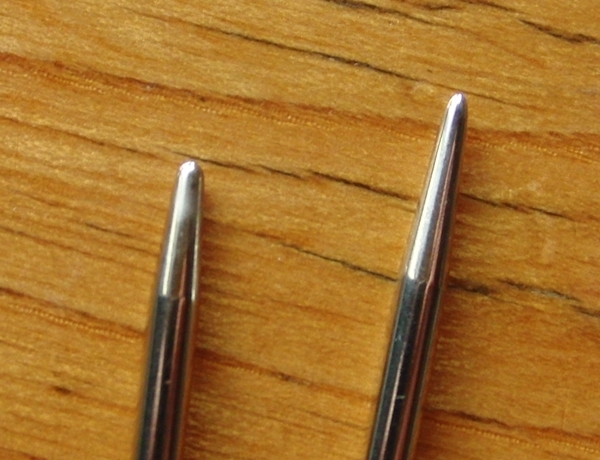 The 3 pieces set consists of metall needles with a short flexible cable (40 mm) in the middle, alike circular needles but much shorter (see pic below). Well, since I use two short circs when I don't want to use DPNs (like in planes when dropping a needle isn't really considered fun), I thought I should like them and the knitting indeed is quite nice. But for me one of the advantages of circular needles compared to my loved DPNs is, that the needles stay in the fabric at all time, so there is no risk of dropping them. With this set once again you need one needle into the fabric, but the other one out of it. Well, for me that still is a bit confusing, it feels like a circ, so I don't have to hold on to it when all stitches are knit, but it behaves like a DPN, so you see me dropping needles even more often than usual, lol. Another something I find rather confusing is, that each needle has two different tips, one basic tip and another more pointed lace tip. Which is fine when I keep knitting, because when there is a change from needle to needle, I always knit with the same tip as long as I make the same movement when changing the needles, but... as soon as I put them down I have to look which is the tip I want to work with, Because yes, there is a difference between knitting with one or the other tip. I, personally, would have prefered needles with the same tips on both sides. So, is there a conclusion yet? Not really, because I've only knitted a little more than half a sock and I am aware that it takes some time to teach an old dog new tricks, so I keep going and see if it gets easier/less annoying the more often I use them. We'll see what I'll say when the pair is done.